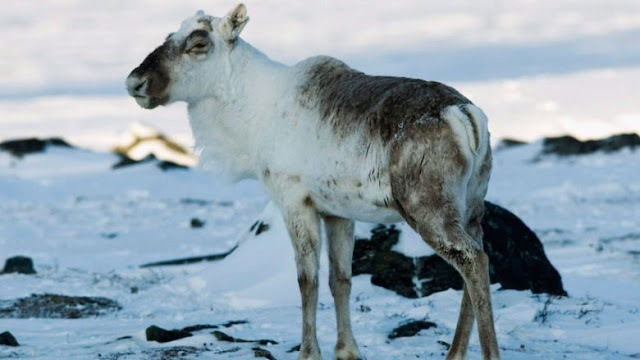 The Big Wobble: Is anthrax responsible for the death of 50 Baffin caribou in the Arctic after outbreak in Russia and Sweden? Is anthrax responsible for the death of 50 Baffin caribou in the Arctic after outbreak in Russia and Sweden? Could the deadly anthrax bacteria be the cause of death to nearly 50 Baffin caribou found on an uninhabited island in the Arctic? The question comes after a child has died and a further 86 people, including 51 children have been affected by the anthrax bacteria in Siberia, plus a further 2,000 reindeer also dead from the bacteria. An outbreak of anthrax has also been reported in Sweden this week. Nunavut's Department of Environment is trying to find out what happened to dozens of dead Baffin caribou found on an uninhabited island in the Arctic. The carcasses of 47 caribou were spotted in July on Prince Charles Island by a research scientist with Environment and Climate Change Canada. The find comes a year and a half after the Nunavut government imposed an emergency caribou hunting ban on Baffin Island - and including Prince Charles Island - after finding their numbers had plummeted. In 2015, the first-ever Baffin Island caribou quota of 250 animals per year was imposed. Paul Smith studies Arctic birds and was flying around the island in a Twin Otter aeroplane scouting locations to build a research station. From the aeroplane, Smith saw unusual white shapes on the tundra. "And as we came in on the final approach to land on this sandbar, I noticed that they were actually carcasses of caribou," Smith said. "It was sort of an apocalyptic scene. There's carcasses of caribou, literally dozens of them on either side of this ridge as you land the aeroplane. It's not a really comforting sight to be surrounded by dead wildlife as you're stepping out of the aeroplane." Smith, along with Nunavut's Department of Environment, collected samples. "Investigations into the cause and extent of the die-off and health of the deceased caribou is ongoing," reads a statement from a department spokesperson. One of the reasons Smith chose Prince Charles Island to build a research station was because of its abundance of wildlife. An aerial survey by the territorial government in the winter of 2014 estimated a third of all Baffin caribou were found on Prince Charles Island. The survey estimated there were between 3,462 to 6,250 caribou, down from an estimated 100,000 from 1985. "To come there and find all of these dead caribou suggesting this large die-off is troubling," said Smith, noting that he also saw 11 live caribou on the island. A total of 86 people, including 51 children, in the Yamalo-Nenets District area affected by the anthrax outbreak known as the 'Siberian plague' are under observation in hospital, spokeswoman for the district's governor Nadezda Noskova said on Tuesday. On Monday, a 12-year old child died after being diagnosed with anthrax in Russia's northwest Siberian Yamal Peninsula. According to the Yamalo-Nenets Autonomous District's authorities, the child was among nine people who were tested positive for anthrax. There are 86 patients from the quarantined area and nearby localities currently in the Salekhard's infectious department. 51 of them are children, since it was decided to first admit the children to the hospital. Swedish authorities are investigating an anthrax outbreak at farms in central Sweden. Eight cattle and a horse on separate farms near Omberg in the ostergotland region have died from splenic fever, as it is also called, after the first case of anthrax was confirmed by agricultural experts last month. They are located a couple of kilometres apart, and officials from Sweden's National Veterinary Institute are currently working on vaccinating livestock and tracing the source of the infection. The dead caribou have their winter coats. They could have died late winter. Anthrax spores, if present, would not have been prevalent in the local environment at that time of year. Freezing rain in late winter does cause caribou to starve. This is a more likely cause of this die off.